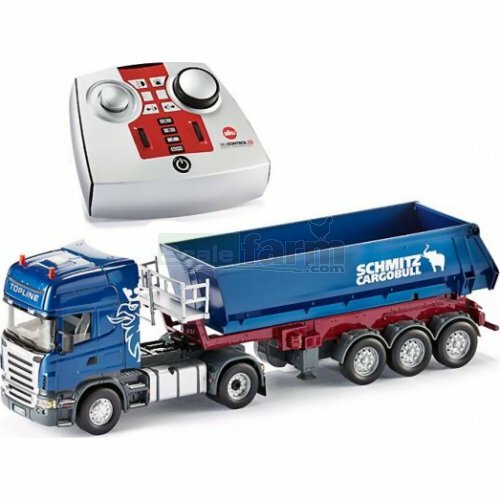 Radio controlled die cast Topline Scania and tipping trailer. Features include; adjustable (digital proportional) speed control, adjustable steering, working indicators, hazard lights, headlights, rear light, flashing beacon (two different flashing modes), one driving and four servo engines, fifth wheel coupling. The remote control handset can control up to four vehicles via selectable channels, as well as the remote control trailer. Supplied with 2.4 GHz remote control handset (SIKU 6708), Large Truck & Mini Trailer Battery Charger (SIKU 6707), Large Truck Battery (SIKU 6705) and Mini Trailer Battery (SIKU 6702).